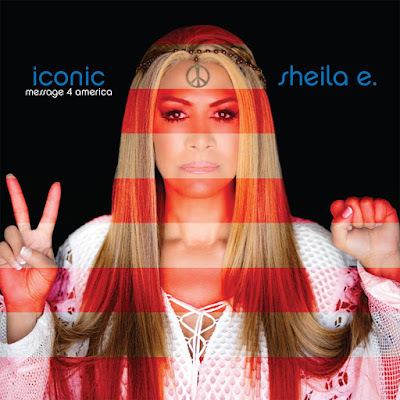 Discussions Magazine Music Blog: An EXCLUSIVE interview with SHEILA E! An EXCLUSIVE Q&A with SHEILA E.
DAVE RAYBURN: Can you explain the connection between our current president, your father, and Prince... and how that connection helped trigger this politically-charged project? SHEILA E: The impetus for the album project came from a place of mourning, frustration, anger, and hope. As I was in a mourning period for Prince, I found myself in mourning for the country during and after the election cycle. The acts of divisiveness, racism, misogyny, bigotry and overall un-American values being promoted were extremely disturbing for me. I felt the need to do something to take a stand against these things. My father taught me to fight for what I believed in. This album was my contribution to that fight. DAVE: What kind of songs were you seeking out as you gathered material to record for this album? SHEILA: Songs with a message. I went back in music history and chose songs that were birthed in or by ICONIC artists that addressed social issues that are still prevalent today. I also chose songs that would cause us to reflect, not just on our past but our future. Songs of hope, love and peace, in an effort to bring people together. Songs that would convey, a message 4 America. DAVE: Who are some of your musical friends who stepped up to the plate to help you deliver your message? SHEILA: We have Ringo Starr, George Clinton, Freddie Stone, Israel Houghton, Candy Dulfer and the E. Family to name a few. DAVE: Not many people are able to get a Beatle to record on their album, but you managed to do just that AND have one contribute to a remake of an actual Beatles song! What was Ringo Starr’s initial reaction to your invite to play, and how did you feel about giving up the drummer stool for this particular track? SHEILA: I was nervous, excited and determined. However, Ringo was so kind and willing to help. He returned my call inquiring about my call about record I wanted him to “Enhance!” To give up any part I may play to Ringo Starr is a blessing to me. I will be eternally grateful to Ringo, and all of those artists, who participated in this project. DAVE: It has been reported that you put aside a more traditional (dance) album in order to bring this project to life. And, in the year leading up to this album, you released a touchingly beautiful single that you wrote in tribute to Prince entitled, “Girl Meets Boy”. Not fitting the ideal context of a record like this, do you think it may one day find a permanent home on another album of yours? SHEILA: The dance record will come out in the near future, although somewhat different than originally planned. However, the song “Girl Meets Boy” is part of another album set that I don’t know if or when I will release. It was written as a memoir of sorts to a person whom I loved deeply and lost too soon. I’m not sure if those memoirs will remain between just him and I, or if it’s something meant for everyone. Right now I feel as if those songs are sacred to us, something I have left that’s just ours. Maybe one day I’ll be ready to let go and release the full album. Until then, I’ll just hold on a little longer. DAVE: In your new recording of Curtis Mayfield’s “Pusherman”, you take the liberty of revising the original lyrics for a more personal presentation. The line “You took Prince. He’s my thing. But we know how you swing. You’re the pusherman...” highlights just how closely our own immediate worlds have become intertwined within today’s cultural/political crises. Did you find this to be incredibly difficult to convey, yet a necessary component of your message? SHEILA: Difficult to convey, yes, but not because it was hard to say. It was difficult in the sense that so many millions of people know the effects and pain of drug addiction that I wanted to be careful not to minimize the powerful message of the song for personal reasons. The truth is that opioid addiction is now an epidemic in this country, and not by accident. The “Pusherman” is real; he’s just moved from the alley to an office with the motto “Profits Over People” hanging on his wall. DAVE: As the tone of your new album is based heavily on the current political climate in this country, how are you approaching the presentation of this album and related touring in 2017? SHEILA: It’s important to me that younger people hear these songs. The overall Message of these songs is now meant for them. We have created a society for our youth in which they are inheriting crisis we created. Racism, bigotry, misogyny, hate. These are things that are taught, passed down from generation to generation. These beliefs are the enemies of this nation. Millions have fought against, suffered, sacrificed, and died in the fight against these beliefs for the betterment of our country. I thought we had taken or made progress against those ideas. But somehow we slipped and have dramatically lost ground. I hope that all people who listen to this album will use it to find a way to help regain what we lost. DAVE: Can you give a brief backstory for Stiletto Flats Music? SHEILA: Stiletto Flat Music is my own independent label. It’s what I believe the music business, for some people, should be. I haven’t sought a traditional record deal for myself since leaving Warner Bros Records in the 90’s. In some ways, I think if I did, I would not still be making music today. Stiletto Flats Music is proudly my own vehicle in which I create at liberty and share my work in music. DAVE: Outside of the live arena, do you recall the last musical project you worked on with Prince, either laying something down in the studio or another unique collaborative moment? SHEILA: There were so many over such a long period of time that it’s difficult to remember specifically. Although we did some studio work in 201something. I laid drum and percussion tracks for him to use. From those sessions "Leader of The Band" was created, he played guitar and provided vocals for that track. DAVE: Looking back on your vast musical legacy, with your own successful solo career and having worked with the aforementioned artists and countless other music legends (Marvin Gaye, Diana Ross, Lionel Richie, Gloria Estefan, etc. ), can you claim which moments are you most proud to have been a part of? SHEILA: Whenever I play or played with my father Pete Escovedo. Those are musical memories I will cherish forever. DAVE: Given the ever-evolving and divisive political landscape today, what are you hoping listeners will take away from ICONIC: MESSAGE 4 AMERICA? SHEILA: That the greatest of America stems from all Americans working together, as equals. There is work that needs to be done for this country that can only be achieved by working with each other and not against each other. Get involved; participate in the processes that make our communities better. I work to promote Peace, Unity, Happiness, and Love.